I wonder what Jesus was feeling as he read the scriptures that day in the synagogue. I wonder if he was anxious or afraid about telling them, “Today this scripture has been fulfilled in your hearing.” I wonder if he worried about what the people would think of him making such a claim. I wonder if his heart was beating fast and if he had butterflies in his stomach. I wonder what expressions he saw on the all the faces that day. Was it acceptance and understanding? Anger, rejection? Confusion, disbelief, indifference, boredom? I wonder what he saw in their eyes and how it felt to be looked at by them. I wonder if he had any idea of where all this would take him. This isn’t simply about Jesus getting up to read the assigned passage for the day. This isn’t like one of us looking at the schedule and saying, “Oh, it’s my turn to read the Old Testament lesson.” According to Luke Jesus “found the place” where these particular verses were on the scroll. He intentionally chose them. Jesus is up to something. Or maybe I should say something is up in him. The Spirit of the Lord is upon him, the same Spirit that descended upon him at his baptism, that filled and led him in the wilderness, and with which he returned to Galilee. Something is stirring within him. In Luke’s account of the gospel what Jesus reads and says today are his first recorded public words. And he speaks them in the town in which he grew up, in the synagogue where he worshipped as a child, among the people who know him and his family. It’s almost as if he is saying, “I’m back and let me tell you who I am and what I am about.” Jesus is naming what God is concerned about in this world. He’s naming a truth and our responsibility for bringing that truth into existence. He’s describing the work and direction of his life. He’s taking a stand, a very public stand. And that terrifies. Not so much for Jesus’ sake but for mine. All my wonderings about Jesus, his anxieties and worries, what he saw, and how he felt; that’s my stuff. That’s me projecting on to him my fear, anxiety, and worry about taking a public stand about who I am and the direction of my life, about naming and embodying God’s concerns for the world, about giving existence to God’s truth in my life. How far will I go for this gospel I claim to love and follow? What am I willing to do and what am I not? Those are choices I make every day; as your priest, as a preacher, as a husband and parent, as an American, as an Episcopalian, and as plain old Mike with all the particulars, needs, and desires of my life. I struggle and wrestle with these choices every day. “For God so loved the world” (Jn. 3:16) is great, but “love you enemies” (Lk. 6:27) not so much. I am happy for good news to be brought to the poor, but I resist selling all my possessions and giving the money to the poor (Mt. 19:21). We claim family as the most important thing in our lives and then Jesus goes and says that whoever “does not hate father and mother, wife and children, brothers and sisters, yes, and even life itself, cannot be [his] disciple” (Lk.14:26). I’ve saved and worked hard to have a comfortable life and one day retire and Jesus says, “Do not store up for yourselves treasures on earth” (Mt. 6:19). And I suspect most of us would rather fight back than turn the other cheek and we’d rather be secure than risk welcoming a stranger. So, yes, I have some real anxiety about preaching and living the gospel. It scares and challenges me. And I don’t think I am the only one. I think we all have fears and concerns about taking stand, about embodying and living the gospel. We know there is a claim and a call on our lives that we sometimes do not want to hear or heed. We know how easy and tempting it is to let the gospel go in one ear and out the other. We know that if Jesus’ words are fulfilled in our hearing today then we will have to change. Maybe that’s why we can so easily talk and laugh about the difference between preaching and meddling. Preaching is okay but meddling is not. Maybe that’s why we so often say that religion has no place in politics. Maybe that’s why we so often blame the ones Jesus says we should be helping. Maybe that’s why we use the church as an escape from rather than an engagement with the world. Maybe that’s why we are so content with just having a friend in Jesus. Maybe that’s why we usually see Jesus as being on our side, and the side of our church, our party, our country. And maybe that’s why Jesus gets crucified. Well, here’s the thing. Jesus doesn’t just preach, he meddles. He is not the answer but a question awaiting a response. Jesus is trouble for the status quo and an interruption to business as usual. He did not come to bring peace but a sword (Mt. 10:34). He says the last will be first and the first will be last. His world is one in which the hungry are filled with good things and the rich are sent away empty. That’s the promise within today’s gospel. Jesus promises a new life and a new ordering of that life. And we are the keepers or breakers of that promise. There is no neutral stand when it comes to Jesus. We all take a stand. The only question is where we stand. For what and with whom do you and I stand? Where do we struggle with this and where are we doing okay with it? This is less about what we believe and more about how we live. It’s about taking a position and not just asserting a proposition. That’s the challenge Jesus set before the people in the synagogue. And it’s the challenge Charles Sheldon set before his congregation. Sheldon was a congregationalist pastor in Topeka, Kansas, in the late 1800s. He preached a series of sermons that later became a book entitled In His Steps. Each week’s sermon became a chapter in the book and told the story of First Church in a small town named Raymond. What would Jesus do? Let’s be careful here. 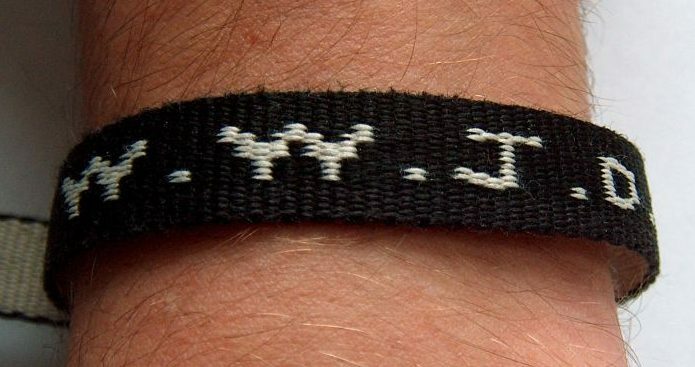 This is not the WWJD of t-shirts and bracelets. This is not a question for others but for ourselves. And here’s the tricky part. I don’t know what Jesus would do today. I am not sure we can even imagine what he would do (and I sometimes wonder if we really want to know). The best clue we have is what he did do and what he said about himself. That’s Jesus’ path. It’s a way of living and relating more than a checklist of things to do. What do you think; are you and I, this parish, willing to do this? And how far down that path are we willing to go? I don’t think we can be certain of where this path will lead, what will happen along the way, or what is coming toward us. And yet, I am certain that we are being asked to take a stand. So tell me, where and with whom will you stand? The sermon on the second half of this story, Luke 4:21-30, may be found here. Truly inspied words that should and do make me uncomfortable. That is the Gospel message. Thanks. Lawrence, your question, “So where does that leave us?” is a great question. I suspect it’s what enrages the people in the latter half of this text (Lk. 4:21-30). They know where it leaves them or maybe they know where they have left themselves. Like you I struggle with these questions. And I like the wisdom of Dr. Harris. Very intriguing. We can only pray for the grace to enable us walk his path.